It’s been a long while. It doesn’t seem that long ago that I was writing about last year’s Exhibition, but here we are in the aftermath of Focus on Imaging 2012. 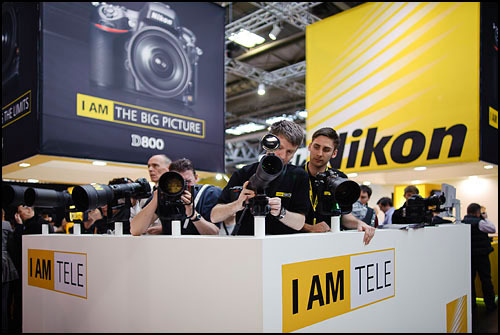 In contrast to the hullabaloo last year over Canon’s last minute withdrawal, this year the noise was of a more positive nature. Although already previously announced, there were several as yet unavailable major new cameras for punters to get their hands on. Both Nikon and Canon had brand new top of the line and one-down camera bodies. In a sector of the market with an average three to four year upgrade cycle for each model, this is a not insignificant watershed, even if the majority of these four models are evolutionary rather than revolutionary. 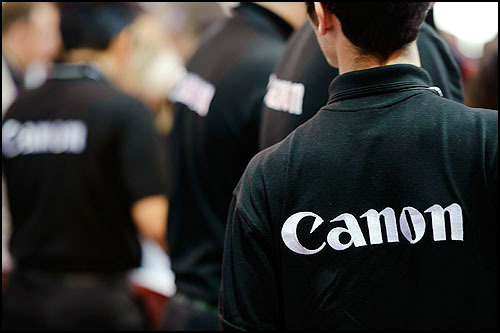 Back in black… After a hiatus which generated much public debate following their late withdrawal from the show in 2011, Canon were back at Europe’s biggest annual imaging show. As mentioned, Canon decided to grace us with its presence this year having staged a late withdrawal last year. In a long, tiered layout that evoked immediate thoughts of Apple Genius Bars, Canon were indeed back with a sizeable presence and a good number of their new 5D Mark III bodies on display – a fact not lost on pro-Canon users keen to point out Nikon’s solitary D800. 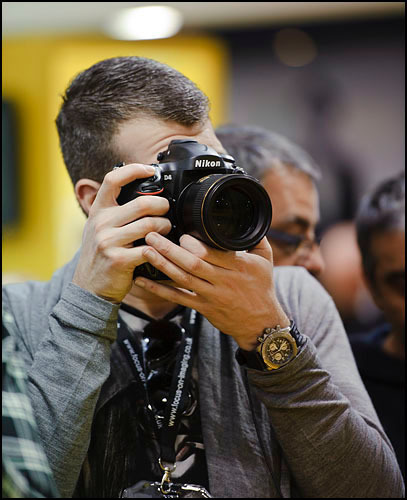 As if XQD, CF and SD slots weren’t enough for the new Nikon D4 (pictured) and D800, they teamed up with their Canon equivalents to introduce a show-only GT slot… the Gaffer-Taped slot. Having made the sensible decision to visit on the Tuesday, queues never quite reached ridiculous, which meant that getting to that single D800 and one of the two D4s on offer wasn’t too stressful. Having got to the head of the queue, the experience unfortunately was a bit anticlimactic if thoroughly unsurprising; both cameras had tape rather unglamorously plastered over empty memory card slots. If anyone’s counting, that’s actually three different card slots for the two camera models – CF and SD on the D800 and CF and the new XQD format on the D4. Having garnered widespread praise for the dual CF slots in the D3 series, as well as watching rival Canon take a bit of flak for having different card slots in the 1D Mark IV (a lesson they learnt with the new 1D X with its dual CF slots), it seems a strange decision by Nikon to settle on different card slots, and I for one would much have preferred matching card slots on the cameras even at the expense of some performance. Something old, something new. You don’t have to be the newest and greatest to draw a crowd – not a newly released exotic telephoto in sight but they can still draw a crowd. Of course it wasn’t all about the two “main” manufacturers even if it does sometimes feel that way. Olympus clearly decided to have a bit of a presence at the show this year, with the bags from the show carrying their marketing. 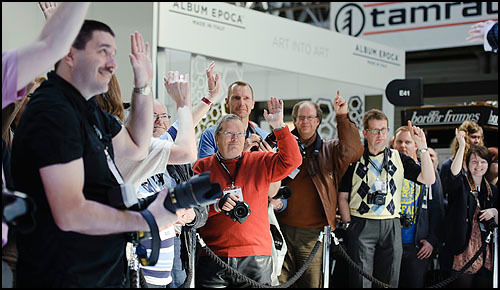 They also drew a big crowd at several points during the day to push their new OM-D system and the E-M5 camera, with Strictly Come Dancing stars Ola and James Jordan roped in to… erm… do their thing. Doing your thing… No, not ballroom dancing. Unashamedly taking pictures of ballroom dancing, even if the lighting and backgrounds are far from ideal. I’m sure the dancing was excellent – not that I’d know – but the PR was certainly top notch from the two stars. James was well coached and well rehearsed in his little marketing speech, and the couple handled the armada of lenses well and ended up posing with people from the crowd for a good length of time, and interacting generally with polish and poise. Hands up if your bank manager doesn’t know you’re here… Or actually hands up if you’re a Strictly Come Dancing fan. Exported by the BBC to 35 broadcasters covering 75 countries, the series and its foreign equivalents are now recognised by the Guinness Book of Records as the most successful reality TV format. Ultimately though, about the only thing I’d learnt from the presentation was that the camera system was small and light, although if Olympus’ goal was just to generate visitor numbers to their stand then it was certainly job well done. Well, I also learnt that… good looking celebrities draw photographers with cameras like… moths to a flame… bees to honey… or any other idiom you care to apply. Actually on second thought, I’m not sure I learnt anything as both those tidbits of knowledge are pretty self evident! This is why you need 36 megapixels. You might be photographing their backs (look at the people in the background! ), but the pictures will be so much better with the (insert new camera model you’re looking at). Fujifilm also had offerings that caught the imagination, from the X10 and X100 to the brand new X-Pro1. Unfortunately with prices that take these admittedly appealing cameras out of my current spending priorities, I was distracted more by an unnamed and uncredited image on the Fujifilm stand. They make nice cameras… just don’t let them near the liquify tool! I suspect that most of us are aware of retouching that goes on to various levels in mainstream media, particularly in the realm of fashion and glamour. But I think what caught me by surprise was the lax standards in disguising the “airbrushing”, to borrow a lay term. Further to that, the various steps of quality control that deemed the result acceptable. In my opinion anyway, the person who did the editing should never have passed that on as a finished product. The person who received the image should have looked it over and flagged the editing as unacceptable. The person who printed the image should’ve picked up on it. The person who mounted the image onto the backing board should’ve picked up on it. The person who put that on the Fujifilm stand should’ve picked up on it. A tummy tuck gone wrong… it just goes to show that occasionally, Photoshop operators can get it wrong. Either that or we have some very funky mosaics. Bad hair day? This is one halo that cannot be blamed on over enthusiastic, under controlled tone mapping. 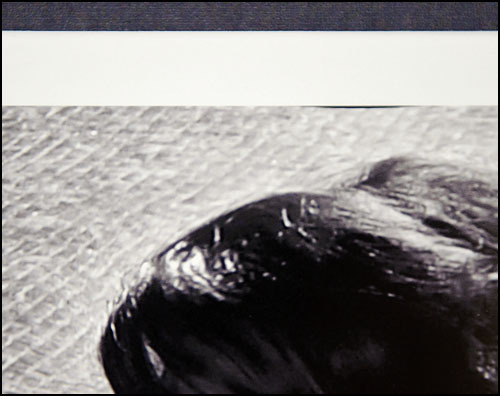 Note also the sliver of black on the edge of the frame as a by-product of pinching or liquifying too close to the edge of the frame. Easily avoidable with a little more care, too. Here’s a hint. If you’re going to… embellish… a model’s figure, do not make life hard for yourself by photographing them against a mosaic background. Although it is certainly possible to do a much better job than was done in this instance. There is certainly too much manipulation and post processing going on in photography circles these days, whether it’s in the fashion industry, local camera clubs, international exhibitions, and even the odd photojournalist image. But that’s another subject for another post.